Twitter, I received only two. One asked for info on character arcs in a sequel, as compared to a previous book. This, of course, refers to the “sequel” as the term applies to follow-up stories in a series, and not to the sequel as the second half of the Scene. But it’s a good reminder that this often confusing term pertains to two totally separate aspects of storytelling. The second question asked for examples of scenes and sequels from popular stories. In answer to that, I’ll direct readers back to the previous posts in the series, since practically every one demonstrates Scene structure from well-known books and movies. In lieu of any other official questions, I thought I’d share a few that were asked in the comments section at the end of previous posts in the series. If you have a question that isn’t addressed here, please feel free to ask it below! A. Speaking generally, “plot” Scenes are usually scenes and “character” Scenes are usually sequels. Scenes drive the action forward; sequels allow characters and readers alike to absorb and react to what’s happened. That, of course, is a gross generalization, but suffice it that a story can’t exist without both. Plot and character, when done right, can never be extracted from each other. A. Showing is all about dramatization vs. summary (which is telling). You may find this post helpful. A. When it comes to outlining, I highly recommend doing just that. 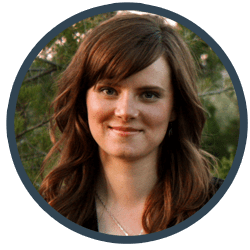 If you can plot out each scene’s arc—goal, conflict, disaster—as well as each sequel’s arc—reaction, dilemma, decision—you’ll be way ahead of the game in constructing a solid plot from beginning to end. As for stating the Scene’s “premise” in the text itself, that’s rarely a bad idea, since you always want readers to understand any given Scene’s focus. Q. When I read about your POV change in the same scene my brain went berserk! Hauntings of don’t head hop played through my mind. I guess if you know the rules and break them, it is okay. When I wrote my first novel, I did many POV switches and was reprimanded constantly because of it. It had a similar feel to what you wrote. A. What you’re seeing in the Scene I quoted from isn’t head hopping. Head hopping occurs when you’re switching POVs (usually multiple times) within a single Scene without any indication of a Scene break. If I had jumped into the second character’s head without using the three asterisks to signal a Scene break, that would have been head hopping. The key to successful POV switches is giving each POV a large chunk of time. In the Scene I’ve quoted from, both characters’ POVs each received half the chapter. If, on the other hand, I had switched back and forth every few paragraphs, that would have been way too much hopping around, even with asterisks to signal the Scene breaks. A. Not that it can’t be done, but it’s absolutely better not to open with a sequel. Start with your character acting, hook readers in, then slow down to reflect. And that brings us to the end of our series! 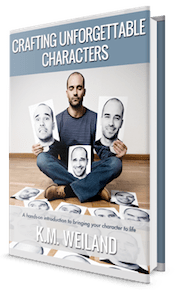 I hope you’ve enjoyed the last twelve weeks and found this journey into the finer points of story structure to be enlightening and even empowering. Solid stories are built on the minutiae of solid Scenes. If you can put together a Scene, you can write a whole book, easy-peasy! 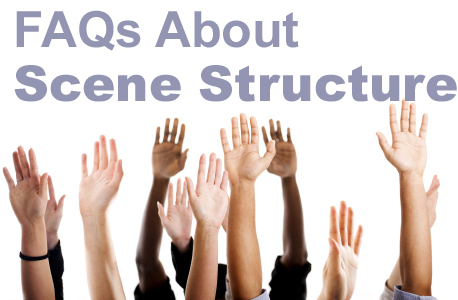 Tell me your opinion: Do you have any questions about Scene structure? Great sound advice as always. I’m wondering if you address the “linking” of scenes to scenes, sequels to scenes and so forth. My muddly process is that I usually plunge in and write several dozen scenes and sequels that don’t automatically build a narrative, and I have to go back and work the “which leads to” part of each one. Is there a word for that? Not sure I’m making 100% sense but I’m grateful for the forum to explore these questions! Only recently discovered your website and have found it so helpful. Thank you. This series has been especially enlightening as for some odd reason given their importance, scenes don’t seem to get much coverage in How to books or blogs. For the first time I really get it. Out of curiosity is there a typical wordcount for a scene (ignore sequels as you said before they could be half a sentence or stretch across chapters)? I read somewhere 1500 max was a rule of thumb. I average between 2500-3500 for my scenes. There really isn’t a standard, although it’s good to shoot for consistent lengths within the same book. My good friend Madison recently recommended I read through this whole series, and I did! it helped me SO. MUCH. I ended up taking a ton of notes and now I understand Scenes much, much better! Thank you SO much for all of the hard work you do. 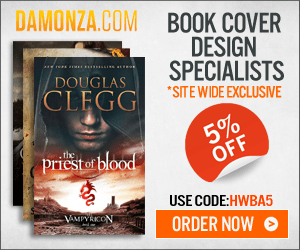 Us beginner authors couldn’t do it without you!! Please help! So I am really struggling with this concept for my book in particular. It’s a contemporary story with a romance subplot. I’m struggling with making everything end in a disaster. It feels like that would only work in action/thriller novels. Thank you so much for any insight! Disasters can be comparatively very small. Both of the instances you mentioned here are perfect–as long as they influence the need for a new goal in the following scenes. First I wanted to say thanks for creating all of these learning tools. I first ran across your work looking for a book who’s protagonist struggled to overcome a really dark secret (Behold the Dawn – amazing book by the way) and after googling for novel advice I randomly ran across this website. Since then I’ve been binge listening to your podcasts over the past few weeks. It’s a lot to take in but I do really appreciate what you’ve done. I’m working on my first novel and, unfortunately, I’m also completely new to writing. About how many “Scenes” do you average per novel and about how long are they? The novel I’m currently working on is right around 75 Scenes (About 35 scenes, 35 sequels, and 5 incidents – what the writing software I’m using refers to when a protagonist accomplishes a short term goal without any setbacks) and so far I seem to be averaging about 1500 words for the scenes and about 1000 words for the sequels. You might enjoy this post on calculating the length of your book. Thanks for the fast response. Just for clarification because of the terminology used, does that mean that your “scenes” and “sequels” are 3,000 words each? Or if you added your “scene” and “sequel” together that they’d total about 3,000 words? Whichever the answer, does that also apply to your 45-60 scenes? Is that 45-60 scenes and 45-60 sequels, or 45-60 scene/sequel combos? Sorry for the confusion, whoever created these terms should be forced to answer all these questions! Sorry for not clarifying. Usually, I combine scenes and sequels into single chapters. So I’m referring to each as 3,000 words.